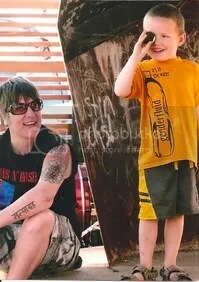 From Bilerico, a really sweet interview between a woman and her genderqueer partner (pictured left, photo from Bilerico), about their identity as “mommy” and being a genderqueer parent. In honor of Mother’s Day, I asked her to talk with me about mothering from beyond the gender binary. In the course of our conversation, we touched on t-ball, chest surgery, field trips, and bathrooms. Koonce: My identity is trans-genderqueer-butch-dyke-mommy. “Mommy” is the word I used as a kid to describe the person who could take all the pain away or support me when I needed it…To say “I want my mommy” meant “I want a kind of omnipotent force to swoop down and take care of this problem.” So, when our son Waylon was born, I chose “Mommy” as a name because I loved the idea of being that force for someone in this crazy world of ours. When I found myself really attached to the idea of being someone’s mom, I realized that my gender identity was–at least for this time–landing squarely in the middle and I really love it that way. I love to hear the word “mommy” and to be called “mom” sometimes. But that has no real bearing as to how I feel in my body. For I am often not at home there. I love these examples of queering parenting, particularly introducing the gender bending aspects of it. Parenting, and reproduction are seen as the quintessential examples of heteronormativity and gendernormativity, but there are many parents who are reimagining these roles along with their gendered identities. I’ve been at the National Gay and Lesbian Task Force’s annual conference, Creating Change. I’ve posted a few blogs from the workshops over at Feministing. Go check them out, there were some great conversations about gender identity. It’s Trans Day Of Remembrance. We lost thirty this year. Mostly transwomen and transfeminine spectrum people, mostly women of color, mostly savagely beaten or stabbed for being too challenging to understand, assimilate, classify. For the first time the NYT wrote about the murder of a transwoman of color in a way that suggests that her death is to be taken seriously, and did so before a well-meaning white non-trans person made a film about it. But it is hard to understand this as progress. I’ve seen a variety of kinds of vigils and memorials for TDOR, but the one that is most vivid for me is one I saw at Wells College, a few years ago. The students there wrote the names of each of the trans dead on a slice of paper that they taped to the back of a dining hall chair. Suddenly it became clear that in the seven years (I think) since count had been kept, a huge hall’s worth of transpeople had been killed. Sitting in the chairs was emotionally intense, and if you were quiet you could hear the chatter of the ghosts, making friends. I sat in Rita Hester’s chair, and missed her. Please take a moment, even if it’s just a breath right now, to remember. If you’re the praying kind, a prayer couldn’t hurt. If you’re the doing kind, tell someone else it’s Transgender Day of Remembrance, and what that means. If you’re the giving kind, make a donation to National Center For Transgender Equality – they can always use it. If you’re the writing kind, write about who you have lost, or found, and post or publish it if you’re able. And whatever other kind you are, please also be the kind who interrupts transphobia. Because it’s killing us, you see? It’s killing us. The National Gay and Lesbian Task Force just launched a new national survey on Transgender Discrimination. I just went to a briefing a few days ago on Capitol Hill hosted by the National LGBT Health Coalition about how little data we have nationally about LGBT people. Why? Because federal surveys refuse to include questions about sexual orientation and gender identity. Without data, we have no way of knowing what the disparities are and no way of asking for funding to address them. Huge problem. One way organizations get around this data issue is by creating their own surveys like this one. In the wake of one of the most violent years on record of assaults on transgender people, the National Center for Transgender Equality (NCTE) and the National Gay and Lesbian Task Force have teamed up on a comprehensive national survey to collect data on discrimination against transgender people in housing, employment, public accommodations, healthcare, education, family life and criminal justice. To date, in 2008, several young gender non-conforming people of color have been murdered, including California junior high school student Lawrence King, who was shot in public during the school day. King’s murder, and the murders of Simmie Williams in South Carolina and Angie Zapata in Greeley, Colorado come in a year in which we are still working to include transgender provisions in a federal bill to protect lesbian, gay and bisexual workers from discrimination in employment. So if you identify as trans or gender non-conforming please take the survey today! I found this open letter (via video) to Alix Olson at Questioning Transphobia. It’s also appropriate because this week marks the beginning of the Michigan Womyn’s Music Festival (aka Michfest). It’s a festival that has been going on for 33 years, an intentional community that is built out of nothing in Michigan and creates a space for womyn to come together and celebrate music. I’ve never been, but the festival has also caused a lot of controversy around it’s gender policy. Specifically, trans women feel they are being kept from attending the festival via the “womyn born womyn” policy. There was an incident in the past where a trans woman was removed from the festival when it was discovered (in the communal shower area) that her genitalia did not match the festival goers idea of female genitalia. In response, Camp Trans was founded, a concurrent festival and protest of Michfest. It happens right across the road and many trans people and allies attend that festival instead. Julia Serrano has written extensively about this exclusion (including in the piece I linked last week) as have other feminists and activists. Alix Olson, along with many other female artists and musicians perform at Michfest every year, which I assume is the reason she is the audience for this open letter. I actually had the opportunity to meet her at a performance she gave at American University last year, and I asked her about the Michfest controversy. Her response was that of all the conversations she had heard over the years about trans exclusion at the festival, the most productive or important ones had actually happened AT Michigan. That might be a cop-out, and I know from talking to friends who have gone to the festival that it’s complicated since many of them really appreciate the space and community it creates. I personally think the festival should be open to people who identify as women (or womyn), and if there are issues with safety or harrassment (which seems to be a fear) then they should be dealt with directly, not via discriminatory policies.